New technology has changed the way builders and property owners approach energy efficiency. Achieving net zero in commercial buildings has become a top priority for many, as the savings can be significant. There are far more reliable and affordable options now than compared to a decade ago, and that trend is continuing. If extra capital is available, this short-term investment could yield positive long-term results. Net-zero simply means you are creating as much energy as you are using. However, there is also net-positive, which means you are creating more energy than you are using. This would give you the option to sell that energy back to the power company. Because solar and wind systems rely on weather patterns, most buildings are still hooked up to the grid to make up for the shortages. There is a downturn in energy production at night or on days with little to no wind, which is why net-positive is harder to achieve than net-zero. The key is to select the right system for the climate, building type, and energy requirements. There are a few renewable energy systems that are highly efficient for commercial use. Biomass, solar and wind energy systems are the most common and affordable options to date. Shop around to find what is available to you in your region. Solar energy is the most accessible, in that many can afford the initial costs. The solar panels are also efficient and movable. Wind energy can be tricky, as areas with little to no wind would not be viable locations for a turbine. Biomass energy is created from natural products such as wood chips, natural residues and more, so a rurally located business or restaurants have the highest likelihood of adopting this method. In addition to adding equipment to generate energy for your commercial property, you can also look for ways to reduce energy consumption. For instance, LED lights offer the same levels of brightness with a fraction of the energy cost. Modern A/C designs, heating pumps and motors have made it possible to heat and cool a building without breaking the bank. Enveloping the building, or ensuring there are minimal places for hot or cool air to escape, will make it easier to maintain the desired temperature in any season. Increasing the amount of insulation, filling cracks or small holes, updating windows and even purchasing insulated window blinds can drastically improve your buildings ability to retain the energy you are using. Alternatives like these can greatly contribute to your net-zero goals. 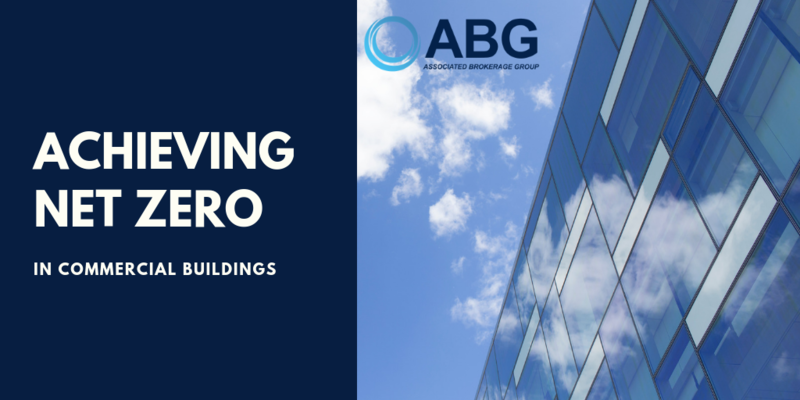 At ABG Realty, we see businesses of all sizes adopt energy efficiency as a way to save money (and appeal to environmentally conscious tenants). Whether it is incorporated in the design of new building or applied as an update an older building, reducing the amount of energy consumed certainly has its benefits. With the right planning, you can achieve net-zero in commercial buildings that you own or manage. Contact us to learn how this can then be leveraged in your lease and property sale initiatives.